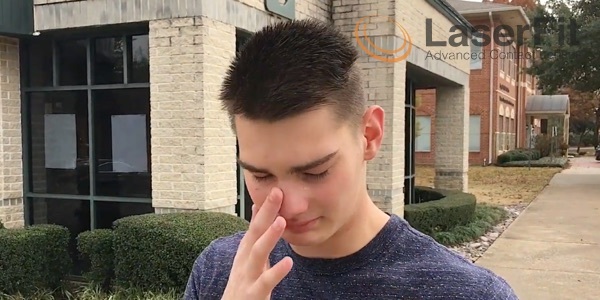 This video shares the story of 16-year-old Luke a patient with Keratoconus. 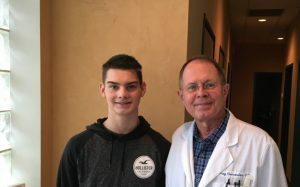 After exhausting his options with multiple other specialists, Luke accompanied by his parents Russ and Leslie traveled to Texas to get fitted with Laserfit custom sclerals. As you can tell, he is quite thrilled with his vision outcome. In this video, Luke and his dad Russ share some feedback including his vision history and struggle with other lenses before finding Dr. Gemoules and Laserfit. He now has 20/20 vision and reports that his lens is so comfortable that he can hardly feel it in his eye. Thank you Luke for kindly sharing your story in so much detail. And thank you Leslie and Russ for your letter describing your experience before finding Laserfit; We have included it below. It was an absolute pleasure meeting all of you! Luke has yearly eye exams since he was young. At eight years old we noticed he would look at things differently the way he would blink or tilt his head—we then moved and went to a new eye dr-who said he was good as well! At age 13 and a half, we went to a new eye Dr. due to insurance changes. She then had the suspicion of keratoconus but was not sure. She referred us to a specialist, and they confirmed it looked most like keratoconus. Just in his left eye he was “fitted’” for a scleral lens by picking out of a box one that looked close enough to fit. The lens was ordered and four weeks later we went back, and he got to try it out. His vision improved one line on the reading chart and the eye specialist was satisfied with that and sent us home. Luke was told to get used to this lens and had an appointment to return in 2 weeks. That was a very long two weeks he could never get the Lens in and once he did it was never a good fit and the fluid would seep out, and he would have to change it several times a day. It wiggled when he walked he would say! We reported back after two weeks; she made some changes. Then waited five weeks this time to try the new lens. The fit was a tad better, the vision the same. We were told fogging and rotating and having to take out the contact several times a day was par for the course. Luke did this for over a year and when it was time to get a new lens we decided to get another opinion and went to another Dr. who specialized in keratoconus. He felt that he could make a lens that would fit better. For five months and countless contacts with different manufacturers, he was never able to get his vision better than that second contact he initially tried. All the while we were on a waiting list to get into one of the top eye places in Michigan. We finally got an appointment there and the Dr. wanted to refer us to a specialist closer to us for a fitting-which happened to be the same keratoconus Dr. we saw first! How frustrating to think about going to the best eye place and getting referred to the same place that has failed you already. That is when I Googled non-rotating scleral lens, and Laserfit popped up. It sounded too good to be true! It was an easy decision as parents as you will truly try anything for your child. Laserfit was our last hope! Now that Dr. G has improved Luke’s vision to 20/20, he is now driving, and school work has been a lot easier for him! He is a lot happier, and we are forever thankful to Dr. G!